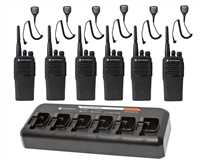 Motorola and offers a wide variety of two way radio walkie talkies for any need you may have. Whether you need compact, discrete walkie talkies to improve communication between the front desk to other areas, among the maintenance team, or you need rugged waterproof two way radios for safety around the pool or beach, we can help! Improving response time to customer requests, reacting to emergency situations quickly and then notifying the proper people of the situation, and addressing housekeeping issues are all handled more efficiently with two way radio communication. Earpieces and other audio accessories are available to keep conversations private and professional. Multi-unit chargers will help keep your radios organized so you can save outlet space and monitor your investment. Long-lasting batteries allow you to utilize the same two way radio for multiple shifts. Many two way radios even have more than one channel so you can separate your team into different groups, allowing them to communicate only to those employees who need to hear their message.